Saturday, March 10th, sixteen teams of four grabbed their brooms and headed out on the ice at the Edmonton Garrison Memorial Golf and Curling Club for a great day filled with friendly competition and plenty of camaraderie. “It’s serious fun,” said ARCCAW bonspiel organizer Diana Stubbard. “There were a few people who are serious curlers, but for the most part it was just a good time. There plenty of people who had never curled before,” she said. The annual bonspiel is also a fundraiser for Wounded Warriors Canada, an organization that honours and supports Canada’s ill and injured Canadian Armed Forces members, veterans, first responders and their families. This year the bonspiel raised over $5,000. Prizes, ranging from an iPad to Oilers tickets were donated and tickets were sold to participants – three for $25. “Of course we received a lot of cash donations too,” said Diana. A team from the painters union (IUPAT District Council 17) were the big winners and received a large trophy. “The painters team had members who actually curl,” said Diana. 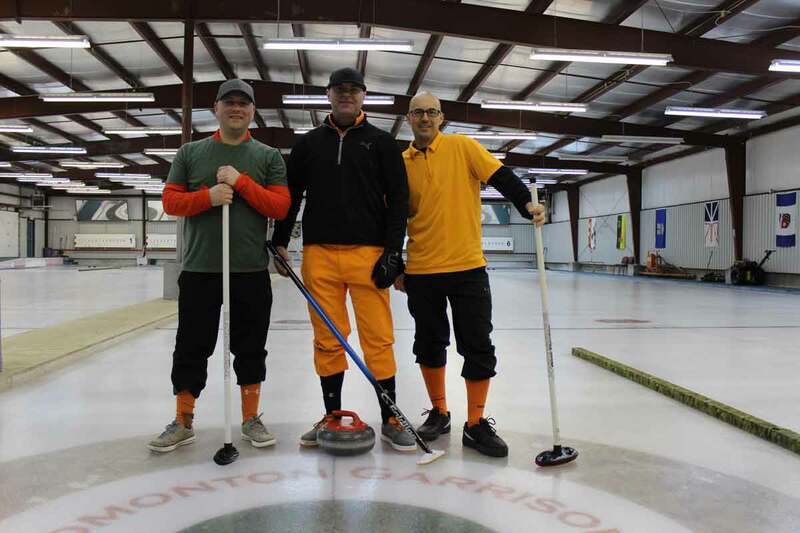 “Two of their team got off a plane from Mexico at two in the morning and they still managed to win.” The painters may have won the bonspiel, but no one walked away empty handed. Every participant received a small trophy, some great memories and the reward of knowing they helped support a great cause.